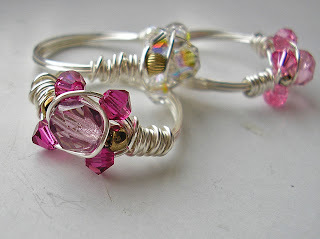 At last I got to see some results from my Sparkly Crystal Ring Tutorial. Cheryl from the UK is very kind to show me her rings this morning. She also gave me the permission to feature them here. Thanks Cheryl. 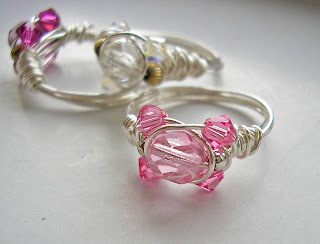 She said "I made three that evening - only in practice wire and with the wrong size crystals (6mm, not 8) so they aren't anything like as good as yours". I guess the size of the crystal is not that important as they turned out very nice and sweet. Cheryl has other talents as well and if you are interested with other items handcrafted by Cheryl, take a peek at her website - Handmade in Wiltshire.